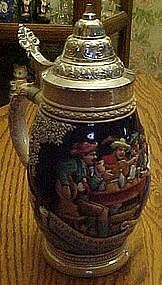 Authentic beer stein from Germany. Measures 10 1/2" tall to the tip of the lid's top. Plated pewter top. Colorful detailed pub scene. All decoration is in relief, and hand painted and glazed. Also written in German is "HATT ADAM BAYRISCH BIER BESESSEN". Detailed and in pristine condition.